Welcome to our guide to the Pembroke Welsh Corgi. The DogExperts.info website aims to ask questions to breeders, vets and experienced owners to get the answers to your most frequently asked questions about the Pembroke Welsh Corgi breed of dog. 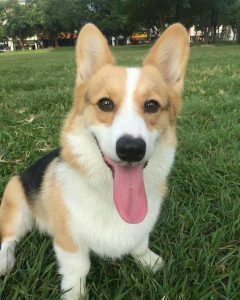 We would love to feature your dog and publish any photos or pictures of your Pembroke Welsh Corgi you would like to email us. Are you looking to buy a Pembroke Welsh Corgi – then see our list of Pembroke Welsh Corgi breeders. Below we feature an interview with the owner of Rango, a male Pembroke Welsh Corgi. My name is Jessica and I’m an American currently living in Taiwan. How long have you owned a Pembroke Welsh Corgi? I’ve had Rango since he was a tiny pup back in 2014. I searched for almost two months to find a responsible Corgi breeder here in Taiwan. Unfortunately, the puppy mill industry is thriving here. Although I wanted a Corgi very badly, I won’t support that. So after many weeks of searching, I finally found a kind family that breeds them responsibly and shows them in competitions. I got to meet both his mother and his father and see the beautiful farm where he was being raised, which reassured me that he was coming from a good home. Rango also has a very impressive lineage! Well, just look at them! Short legs, handsome face, big ears, wiggle booty. Corgis have it all. Plus, they’re very sweet and good natured. I can’t speak for all Corgis, but my Corgi is very attached to me. He has a few dog friends and he’s polite with other people, but he loves me the most. He is definitely a velcro-dog! He and I are also pretty active. We go running and play soccer together. I believe the Pembroke Welsh Corgi is quite a popular dog on social media/Internet these days, can you tell us how this started? He’s getting there. I started his Facebook and Instagram accounts because the photos I posted to my personal accounts got such a positive response and people stop me on the street all the time to tell me how cute he is. Sometimes they don’t even stop us, but it’s so wonderful to see people’s faces just light up when we walk by. All because of my little doggy. So, I guess that was my main motivation: bring more joy into the world. We know celebrities have many issues with fame, how is Rango handling the attention? Rango is very down to earth. Haha! Actually, I trained him using English, but most people speak Chinese where we live, which he doesn’t understand. So when people stop us at the park to take his photo, he doesn’t listen to them. Just another rude celebrity dog ignoring his fans, I guess! Why do you think people should choose the Pembroke Welsh Corgi over another breed of dog? Ideally, people searching for a dog will be able to find their perfect match at a shelter. However, if, like myself, you’re looking for a dog that is sweet, smart, small enough to be comfortable in a city apartment, but still active and athletic, and unbearably cute, then you must get a Corgi. Plus, you can just put the things you don’t want them to reach onto a table and forget about it. What are your feeding routines, such as how often and what types of food do you feed the Pembroke Welsh Corgi? Rango eats twice per day, morning and evening. He gets grain free kibble at every meal along with a rotation of raw meat, bones, and his favorite veggies. I am strict with his diet because Corgis are prone to weight gain and he will literally eat anything, anytime. Obviously grooming is another major aspect of owning a Pembroke Welsh Corgi, can you offer any tips, advice and popular accessories for your Pembroke Welsh Corgi? Buy a Furminator. It will be your best friend! I bring it to the park and brush Rango under the trees so that the birds will have some luxurious fur to make their nests with. The weather here is quite hot in the summer, so I often see shaved Corgis, but I think it’s unnecessary if you brush them regularly and keep them inside during the hottest part of the day. The amount of time you invest early will pay off later. Train them well when they are young and they’ll be good dogs the rest of their lives. Also, because of their unique shape, take special care to avoid putting stress on their backs. We currently live on the third floor, but we always take the elevator down to protect his back. Oh, and get a ramp for the furniture so they can get up and down with ease. 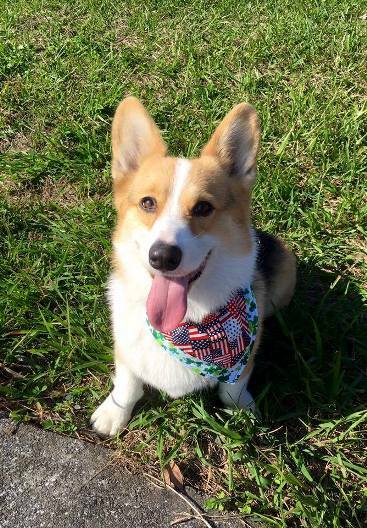 We have another fantastic interview this time with Andrea, owner of a female Pembroke Welsh Corgi named Duffy. Hi, I’m Andrea, living in Budapest, Hungary with my sweet Corgi, Duffy. I’ve been owned by her since Sept. 24, 2012, after having had Irish setters for more than 20 years. Duffy was born in Romania out of a Russian born daddy living in Hungary and a Polish born mom living in Romania. Her daddy’s owner is a well-known breeder in Hungary and she brought the girls of the litter back to Hungary. The two boys stayed with mom’s owner. The whole litter has been registered by the Hungarian Kennel Club under the „Born To Be” affix. An old time friend of mine is Duffy’s co-owner but he had had 5 other dogs in his house that time, so Duffy has been living with me since then. Corgis are the best dogs to live with. It’s a phrase but true: big dogs in a small package. They have that sense of humor I love so much, and they are so emphatic. Very kind, friendly, loving life and all living creatures around. Duffy is an office corg, she comes with me to the office every day. When walking in the park or in the street it’s so typical someone runs over yelling OMG! A CORGI! giving her kisses and petting her. And she enjoys every moment of meeting and greeting new friends. I think it’s because they are so cute, funny and emotional. And Corgi Nation (the worldwide community of crazy Corgi people) is the best I’ve ever met. They are always helpful and distance can’t avoid them keeping in touch. Thanks to Facebook Duffy and we have so many friends from the USA, Canada, Japan, China, Colombia, Brasilia, South Africa, Australia and many other countries from all over the world. We are proud members of this wonderful community. I think our world needs more smile, and Corgis are a good reason for smiling. Their cute appearance and happy, smiling face makes people happy, too. A Corgi is smiling – and World will smile back! Get a Corgi and never a dull moment anymore! Thank God not any with Duffy but I know there may be health issues in the breed. We have lost too much friends due to DM (Degenerative Myelopathy) and several kinds of cancer. I’m so lucky as Duffy is shedding only twice a year. But frankly, if you have a Corgi you need some tools, too: a good brush, a comb, and a Coat King for removing undercoat. It takes only 10 minutes a day but gives a lot of comfort both to you and your Corgi. Bath is needed only in case of extreme circumstances as their coat is self-cleaning and waterproof. Never, NEVER cut a Corgi’s coat!!!! Their double coat gives an excellent protection in all weather conditions. Well, Corgis are really the best dogs, but not for everyone. They will need your time and attention and happy to take part of the everyday life of your family. Good choice when you’re working from home or can take your Corgi with you. Despite their little, stubby stumps they use for legs, Corgis love hiking, swimming and running with other dogs even with much bigger dogs. They do well with children, best babysitters for the smallest and later on playmates of the bigger kids. Most Corgis get along well with cats and other pets, too. Corgis are commonly used (mainly in the USA and Canada) as therapy dogs in elder people’s homes, in hospitals and for children dealing with mental problems. Lots of Corgis make appearances in Agility classes, and they are also interested in Barn hunt. Must be kept in mind they are originally herding dogs, and not only cute couch potatoes, they love „doing something” and living an active, sporty life! Hope my very personal and subjective (which I think to be the most objective, certainly) helps the future owners to decide if a Corgi matches to their family and lifestyle – or not. Thanks Andrea for this wonderful interview and for sharing the lovely photos of Duffy. If you want to find out more, you can visit this page. Why Choose a Pembroke Welsh Corgi? What type of owners buy a Pembroke Welsh Corgi? What in your opinion are the best things about the Pembroke Welsh Corgi breed? Why do you think the Pembroke Welsh Corgi is special? What are your favourite things about the Pembroke Welsh Corgi? Are you glad you choose to buy a Pembroke Welsh Corgi and not another breed? How would you describe the Pembroke Welsh Corgi temperament? What advice might you give to people thinking about whether they should buy a Pembroke Welsh Corgi over other breeds? What are the history and origins of the Pembroke Welsh Corgi? What colors of Pembroke Welsh Corgi are most popular? What does the Pembroke Welsh Corgi look like? What are the pros/cons of the Pembroke Welsh Corgi breed? What can a new owner expect in terms of differences between the Pembroke Welsh Corgi and other breeds? What type of typical personality does the Pembroke Welsh Corgi have? Is it possible to describe a fairly typical Pembroke Welsh Corgi? What is the breed standard/description for the Pembroke Welsh Corgi? Are there any downsides to owning a Pembroke Welsh Corgi that prospective owners should be aware of? Is the Pembroke Welsh Corgi breed of dog suitable for first-time dog owners? Some breeds can be described as greedy and prone to weight issues, would this apply to the Pembroke Welsh Corgi? Is the Pembroke Welsh Corgi a breed suitable for a person or family that are out at work all day? Some owners seek a breed suitable for barking and offering a guard dog role – how does the Pembroke Welsh Corgi match up to that role? Are there myths about the Pembroke Welsh Corgi – in other words do new potential owners come to you with misconceptions about this breed? What types of questions do you get once owners get their Pembroke Welsh Corgi home? What is the typical temperament of a Pembroke Welsh Corgi, so people know what to expect from their new pet? When fully grown how much on average does a Pembroke Welsh Corgi weigh? When the Pembroke Welsh Corgi is full grown in size what is the maximum height and length expected to be? 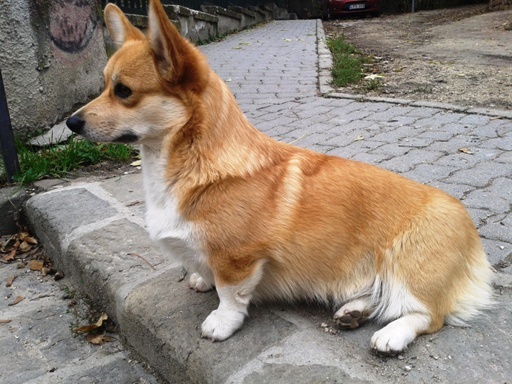 Is the Pembroke Welsh Corgi ever crossed or mixed with other breeds of dog? Does the Pembroke Welsh Corgi smell or drool a lot? Do you have a Pembroke Welsh Corgi growth chart? What breed group does the Pembroke Welsh Corgi come under? Are there some types of people that you can suggest the Pembroke Welsh Corgi is not suitable for, perhaps families? How is the Pembroke Welsh Corgi with children? Do you think the Pembroke Welsh Corgi is suitable for families with young children? 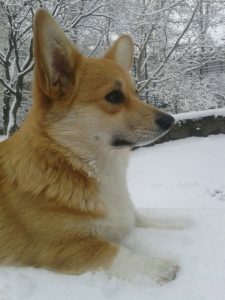 How does the Pembroke Welsh Corgi get along with other (existing) pets and do you have any tips or advice for new Pembroke Welsh Corgi owners in terms of successful integration? Is it better to buy one Pembroke Welsh Corgi or two? 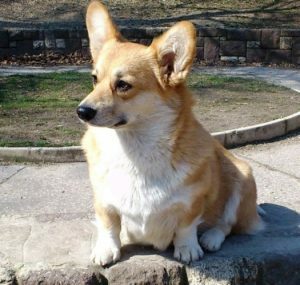 Would the Pembroke Welsh Corgi be suitable as a guard dog? Can I leave my Pembroke Welsh Corgi during the day while I go to work? What is the expected average lifespan of the Pembroke Welsh Corgi? In terms of life expectancy, how long on average would the Pembroke Welsh Corgi breed live to? How to handle the Pembroke Welsh Corgi puppy to start off – how much food, what type, how often? Do owners need to consider supplements for their Pembroke Welsh Corgi? How much did your Pembroke Welsh Corgi cost to buy? Can you offer advice to people looking to buy a Pembroke Welsh Corgi and how much should they spend? What advice would you offer new Pembroke Welsh Corgi owners? What types of people are buying the Pembroke Welsh Corgi and why? Where can I buy Pembroke Welsh Corgi rescue dogs or find a Pembroke Welsh Corgi for adoption? Please note that buying or searching for a ‘cheap’ Pembroke Welsh Corgi can be false economy as they may have health issues that cost you far more in the long-term – always buy from a good and responsible breeder! How much do Pembroke Welsh Corgi puppies for sale cost on average? How would you describe the Pembroke Welsh Corgi puppy to potential new owners? What types of owners are best suited to owning a Pembroke Welsh Corgi? What inspired you to become a breeder and did you start with the Pembroke Welsh Corgi? As a Pembroke Welsh Corgi breed expert, are there any ‘essential’ tips you would like to share with new owners? How long does it take to housetrain/potty train a Pembroke Welsh Corgi? We invite you to email us your Pembroke Welsh Corgi’s pictures, in particular we are looking for photos showing Pembroke Welsh Corgi puppies at 1, 2, 3, 4, 5, 6, 7, 8, 9, 10, 11 and 12 weeks old as well as early pictures such as 1, 2, 3, 4, 5, 6, 7, 8, 9, 10 and 11 months old to a year old. Do they have any nicknames or does the Pembroke Welsh Corgi have popular names? If my Pembroke Welsh Corgi is pregnant what might the litter size be? Could the Pembroke Welsh Corgi be dangerous around young children? How do you prevent a Pembroke Welsh Corgi biting? 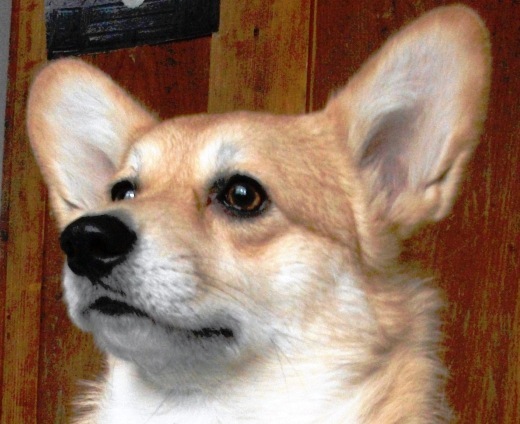 How do you prevent a Pembroke Welsh Corgi chewing? How do you stop a Pembroke Welsh Corgi jumping up? Does the Pembroke Welsh Corgi have an issue with excessive digging? Why does my Pembroke Welsh Corgi keep growling and barking? Is there a reason my Pembroke Welsh Corgi dog is often scratching excessively? 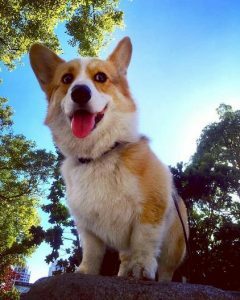 In comparison perhaps to other breeds what can you say about the Pembroke Welsh Corgi and their exercise needs and do you have any tips or advice for new Pembroke Welsh Corgi owners? As a breeder of the Pembroke Welsh Corgi, do you prefer a collar or harness? As an expert of the Pembroke Welsh Corgi breed do you prefer a standard leash or retractable? 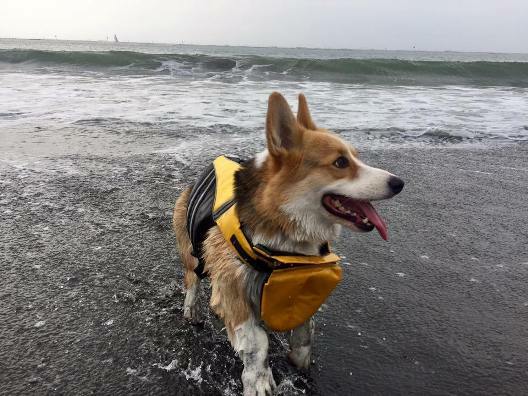 Can you offer any dog walking tips for Pembroke Welsh Corgi owners? What games and toys can you recommend for the Pembroke Welsh Corgi? How intelligent is the Pembroke Welsh Corgi compared to other dog breeds? Do you have any special grooming routines or tips and advice for new Pembroke Welsh Corgi owners? What accessories are required to be purchased for grooming a Pembroke Welsh Corgi? How much do Pembroke Welsh Corgi shed and how do I maintain their hair and how often? Is the Pembroke Welsh Corgi a hypoallergenic breed? Any advice/tips you can give concerning cleaning and bathing your Pembroke Welsh Corgi? Can you offer new Pembroke Welsh Corgi owners advice concerning fleas and maybe products you use in treatment and prevention? What advice and tips could you offer to owners who might wish to follow your path in showing the Pembroke Welsh Corgi? What started your interest in showing the Pembroke Welsh Corgi? If a new owner perhaps wanted to meet other owners or find out more – perhaps they have an interest in joining a local club or maybe they wonder how they can start showing their Pembroke Welsh Corgi – where would they begin? How would an owner know they have a show-quality Pembroke Welsh Corgi and how would they start off? What inspired you to become a breeder and did you start with Pembroke Welsh Corgis? What official organisations are there for the new Pembroke Welsh Corgi owner and what benefits or services do they provide? In buying a Pembroke Welsh Corgi, can you offer advice and tips to new owners? How did you progress to becoming a breeder and why focus on breeding the Pembroke Welsh Corgi out of all the breeds you could have chosen? What do you think makes the Pembroke Welsh Corgi special to you? In comparison perhaps to other breeds what is it like to train a Pembroke Welsh Corgi and do you have any tips or advice for new Pembroke Welsh Corgi owners? How should new owners approach bringing a new Pembroke Welsh Corgi home, any advice and tips you can give? Should I allow my Pembroke Welsh Corgi to sleep in my bed or elsewhere in the house? Should my Pembroke Welsh Corgi sleep in a kennel or crate? Health is always a major concern when buying a dog, do you have any advice for new Pembroke Welsh Corgi owners to be aware of in particular? What is the recommended schedule for vaccinations for your Pembroke Welsh Corgi? What type of health issues can a Pembroke Welsh Corgi have and how do you deal with preventing these? Why does my Pembroke Welsh Corgi have diarrhea? Why is my Pembroke Welsh Corgi vomiting and do I go to the vets? When should I take my Pembroke Welsh Corgi for vaccinations and which ones do they need and how often? How often will my Pembroke Welsh Corgi be in heat? Should I consider getting my Pembroke Welsh Corgi spayed or neutered and when and how much does this cost and what are the benefits? My Pembroke Welsh Corgi is limping, what should I do and should I go to a veterinarian surgeon? Why is my Pembroke Welsh Corgi not eating? How much does it cost to insure my Pembroke Welsh Corgi? What healthcare issues or diseases might be excluded from companies that provide Pembroke Welsh Corgi dog health insurance? What age would you class as an ‘older or senior’ Pembroke Welsh Corgi? What changes in food and diet would you suggest making for an older Pembroke Welsh Corgi? Do you feed any supplements to an older Pembroke Welsh Corgi – or anything else which helps them as they age? Are there any health issues particular to a senior Pembroke Welsh Corgi dog? Do you have any advice for owners of an older/senior Pembroke Welsh Corgi or tips you can pass on? Learn more about the Pembroke Welsh Corgi by watching the video below.